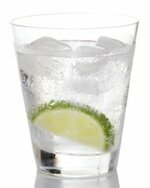 One question seems to come up somewhat often: for calorie purposes, does the brand of vodka make any difference? Is Grey Goose calorically any better or worse than Smirnoff, Absolut, Skyy or well vodka? NOPE! Note that there is one exception to the 97 and 121 rule in Devotion Vodka. Devotion has added protein, so even though it’s 80 proof, it checks in at 105 calories. Aside from the exception, in anything labeled “vodka,” all of the carbohydrates have been fermented into alcohol. There’s no residual sugar, and the calorie count is a direct result of its proof. So, what makes premium vodka any different than the stuff in plastic bottles? Basically, it’s the purity of the distillation and filtration process. The cheaper vodkas have more cogeners, which are nasty hangover-causing chemicals and the likely subject of a future post. Good to know! Any word if Skinny Girl vodka is lower calorie? I think y’all are getting calories in an “ounce” OZ, confused with a “shot”. A ‘shot’ is 1.5 oz, or one and half ounces. 68 cal per ounce, is 97 cal per shot (1.5oz).